There’s only one comic in production right now that’s carrying forward the narrative of Disney’s epic new Star Wars film trilogy. If you’ve missed out on Marvel’s Poe Dameron, now is an excellent time to dive in. The Poe Dameron series of kicked off in 2016, about four months year after the release of Star Wars: The Force Awakens. It promised to tell the story of Poe Dameron’s own special forces group, called Black Squadron, and detail its search to find the map that would lead the Resistance back to Luke Skywalker. Trouble is, it took writer Charles Soule and his team about two years to get there, which caused some readers to complain that the comic wasn’t working hard enough to get to the point. But the wait has been worth it thanks to the payoff in the last two issues, which has been huge. 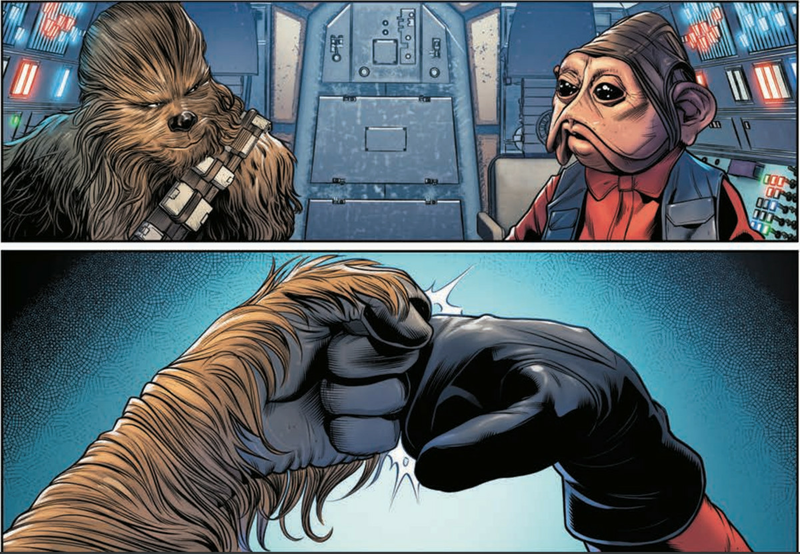 Chewbacca and Nien Nunb, together for the first time in the cockpit of the Millennium Falcon. 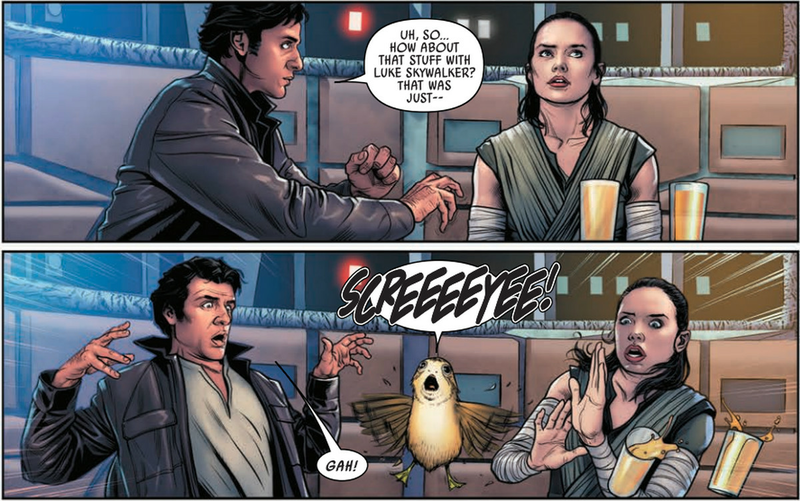 In its 26th issue, Poe Dameron began a new storyline called “The Awakening,” and the comic has finally converged its own timeline with that of the movies. Issue #26 and today’s issue #27 take place inside the Millennium Falcon, with Poe, Rey and Fin all crowded around the gaming table and General Leia Organa and Chewbacca in the cockpit. Fans will recall that Poe and Rey hadn’t actually met since the very end of Star Wars: The Last Jedi. So Soule has the luxury of letting them get to know each other for the first time. It begins with a series of flashbacks, with Poe taking the opportunity to fill Rey — and eager readers — in on what he was up to while he was off screen during the action in The Force Awakens. The art, handled by Angel Unzueta throughout, is spectacular. 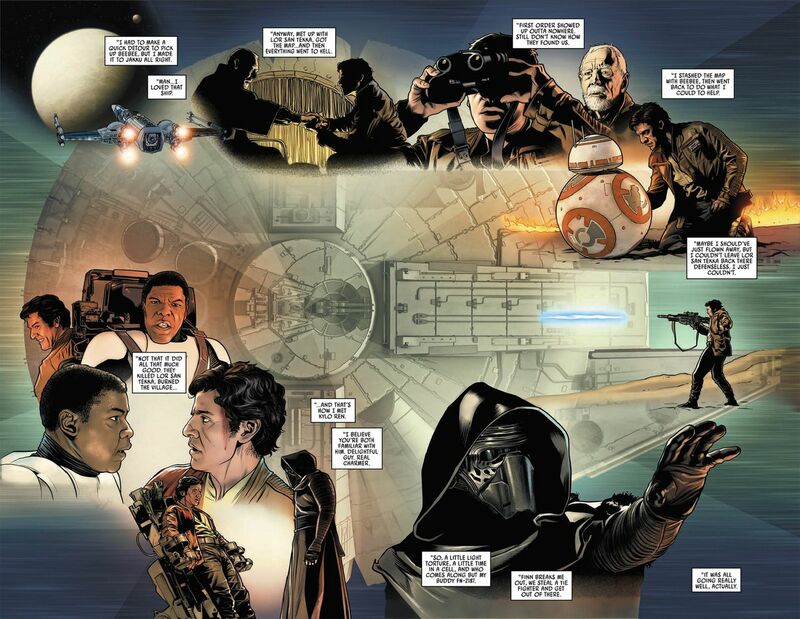 A two-page spread from Poe Dameron issue 26. In issue 27, the story rolls back the clock just a bit further to tell the story of Black Squadron’s earliest scouting mission of the First Order’s Starkiller base. We’ll soon know the fate of pilots Snap Wexley, Jessika Pava and Karé Kun. Bottom line, if you enjoyed The Last Jedi and want to get up to speed on the connective tissue that’s going to link that movie to the next, it’s time to start reading Marvel’s Poe Dameron.